First, about 1000 new followers every 5 minutes or so. Then, I noticed the pace increasing. Then it was 2000 new followers every 5 minutes. Then 1000 followers every 90 seconds. Then, from 12pm CST to 12:10pm CST the account gained 9500 followers. In the end when Twitter shut down the account, it had gotten to just over 111k followers, up from 77k just 90 minutes earlier. 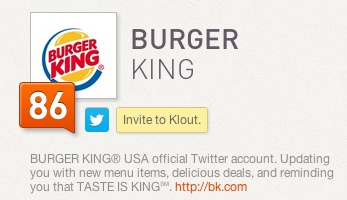 On a positive note, I’m certain that Burger King’s social signals will actually help increase BK’s Klout score, which is currently an 86. 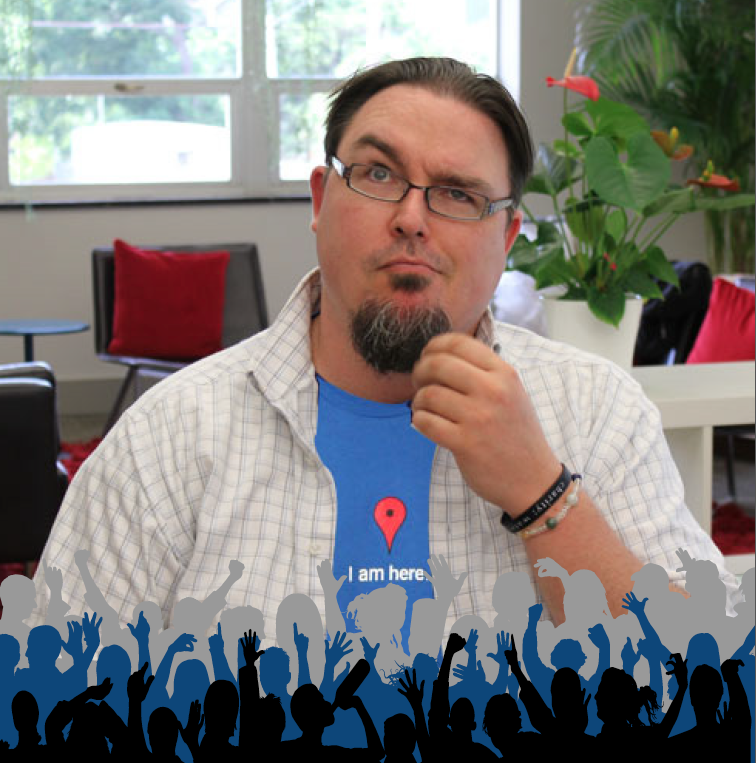 Klout and online influence isn’t that big of a deal, considering your brand’s site just got hacked and the whole internet is making fun of you… but, it’s a small consolation… and I’m trying to look on the bright side for the BK Social Media team. 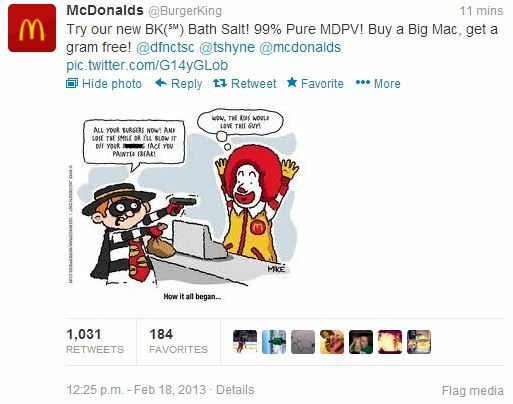 In the approximately 75-90 minutes of the account being actively hacked, the account gained almost 35,000 new followers, a top global trend, an increased Klout score and most likely, a brand new social media team.
.@burgerking mentioned 125,104 times over last 90 min. Gross impressions top 231,258,030 – but NOT a #failurewhopper. Thanks for making this Monday entertaining, Anonymous. McDonalds claims innocence in an empathetic tweet to Burger King. This should be a reminder to all social media community managers to have REALLY, REALLY, REALLY difficult passwords. Perhaps, they should have tred the Norton Password Generator on their Identity Safe or a similar password tool? 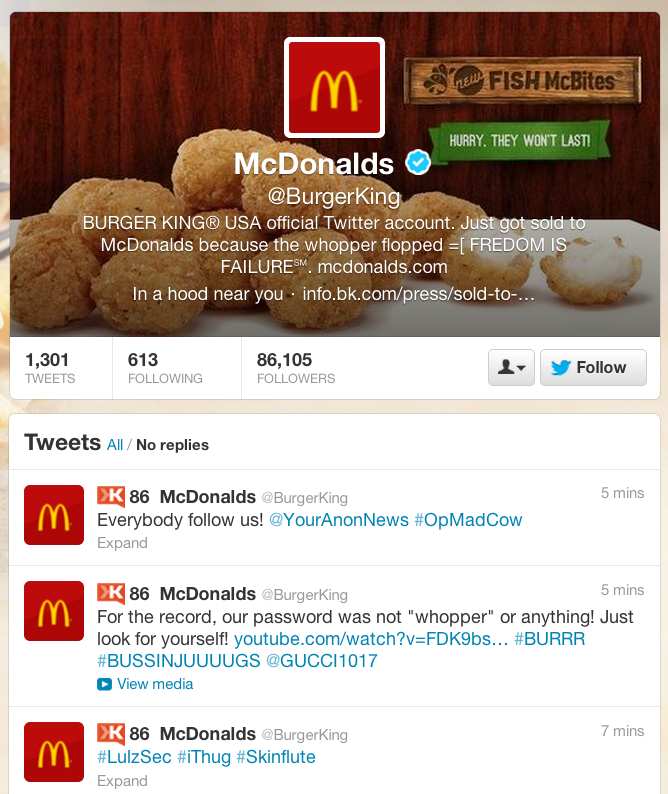 UPDATE: @BurgerKing to post apology later on their official Facebook account after apparent Twitter hack. Some posts had racial epithets, references to drug use. 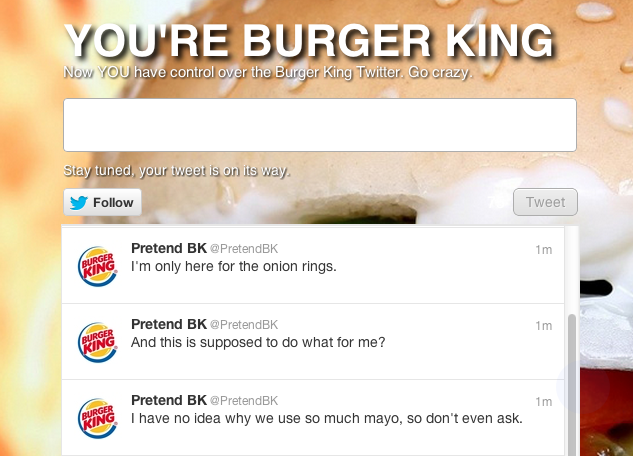 UPDATE #2: Parody Burger King twitter account @PretendBK & website pops up… Pretend You’re Burger King, a site where ANYONE can tweet anything. Burger King will never live this down. Oh my. I love the interwebs. UPDATE #3 Burger King didn’t apologize like was mentioned earlier… they have, however, got access back to their Twitter account. They’ve made it password protected, while they work to reupload imagery and logos… and to delete the old, hacked tweets. For a more in-depth analysis on the Burger King Twitter hack, check out Jeremiah Owyang’s piece, Social Media Crises Has Many Points of Failure. I definitely agree that this could be turned around into a good situation for Burger King. Not only has it dramatically increased their followers, they have had buzz all day long. 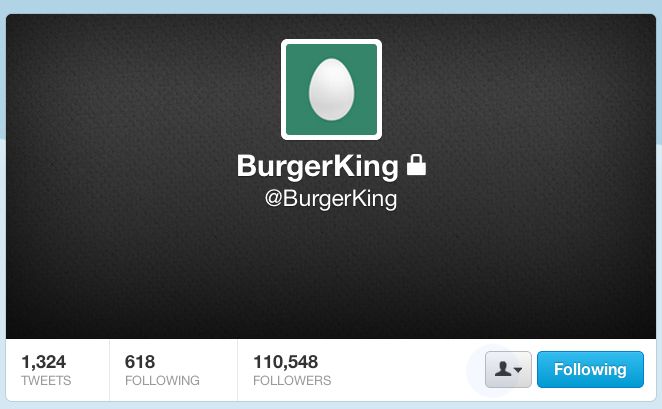 Before this happened, who even followed Burger King on Twitter?! I also think that this may increase sales for Burger King and hopefully this situation will turn out for the better for them! Loved the way you included other tweets from Twitter! I actually ate at BK yesterday because the timeline buzzing about it made me fancy junk food and it was near. So increase sales, yes. I wanted a pizza up to that event. I would have commissioned an Anonymous-centred ad already if I were their head of marketing though. And apologised, of course. 1) Monday…hacked…don’t do too much talking about it… let the media cover it and talk about it, as they love to do so. 3) Wednesday, announce a free or highly discounted item at all Locations coming soon. People love free food. 4) Let the media talk about Wednesday’s announcement, hit all PR, news sources big time. 5) Friday, all day, give the free/discounted items out—No question asked –let people enjoy your food. Tell people to follow “us” on Twitter, put little cards with your Twitter name in each item of food. Slam the name out there. 6) Maybe let this run through the weekend. Yeah, this will cost some money, however the “spin” on this could be a good thing, if you’re going to be made fun of for having week passwords(or whatever) it better come from you and not someone else. Make fun of the fact that you got egg on your face.